Killock Shoal Lighthouse was built in 1886 as a rectangular screwpile lighthouse. 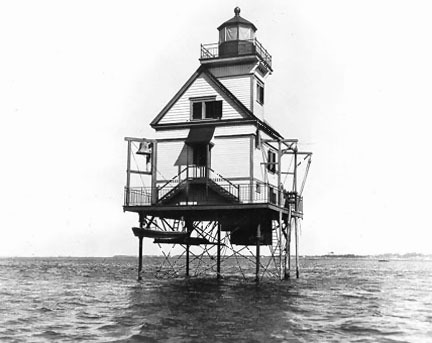 It was not a standard Chesapeake Bay style screwpile as it was a 1-1/2 story frame house with a square frame light lower at one end. The lighthouse was located at the north end of the Chincoteague Channel and adjacent to Chincoteague Island. The light was deactivated and dismantled in 1939 and replaced by an automated light on a steel tower erected on the original foundation.